There is no doubt about the fact that Lightroom is the preferable option for professional photographs. It has already out-shined other photo-management and editing tools on the fronts of ease of cataloging, organizing and managing the photographs — the primary requirement of the professional photographers. With Lightroom 3 Adobe has introduced some cool features which makes it irresistible solution for the photographers. Let’s check out what Lightroom 3 has in store for you. Tethered capture allows you to shoot the photographs through Lightroom. You can connect your camera to the computer via the usb cable and control the camera right from Lightroom 3. Currently however you will need to set the camera settings like shutter speed, aperture and ISO in-camera while you can release the shutter from Lightroom’s interface. The photos will be downloaded right into Lightroom 3. Are you ready for this one? Get started with connecting your camera to your system, configuring the tethered capture settings and a trial shot! But there is a caveat to it — it presently provides support for Nikon and Canon DSLRs only. You can check the list of supported cameras here. 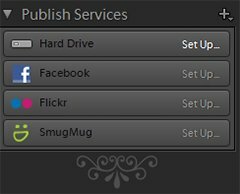 The Library Module of Lightroom 3 features the publish services which enable you to instantly publish the photos on Facebook, Flickr and SmugMug. You need to configure the settings and provide your account credentials to get started with uploading the photos directly from the Lightroom’s interface. The coolest thing about this feature is that it provides you the flexibility to connect to your photostream and view the comments & ratings to gain an insight into popularity of your photographs in Lightroom itself. The configuration options allow you to watermark and embed IPTC tagging as well as keywords to make your photographs search friendly. What could be better? Lightroom 3 features the watermark editor which is fully-capable of watermarking the images with a difference. You can choose from text and graphic effects. Watermark effects and applying shadow adds to the creative opportunities to employ with watermarking editor. Once saved the watermarks can be applied from within Slideshow, Print, Web, Export and Publish modules. 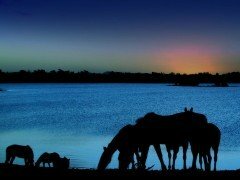 Watermark helps you protect your photographs from unauthorized use (at least to some extent by making it obvious who the photo belongs to). Get your hands on creatively copyrighting your images with Lightroom 3. Lens correction is viewed as the major advancement in Lightroom 3. Prior to this you had to open the files with Photoshop to correct the lens distortions. You can now correct the optical aberrations like distortions, chromatic aberration and vignetting effect. You can correct the lens distortion either by using the lens profile or make the adjustments manually and come up with some creative effects (like rotating the images or transforming them horizontally / vertically). Still using Lightroom 2? Time to switch!